Only 35k, but it ended well with an 18:32 5k. The objective was to heal my hamstring and run a decent 5k on Sunday, so mission accomplished. 8k very easy @5:39. No track workout. 8k easy @ 5:26. No pain in hamstring. 6k @ 5:06. Easy, then from 2.5k @5:00 for one k, 4:06 for one k and 5:00 for last 1.5k. Hamstring ok, but felt kind of sluggish (from not running much). Mari Tanagawa Ekiden. Mari Tanigawa has been retired for several years but is still a very popular runner in Japan because she became one of the top Japanese marathoners without coming up through the corporate pro team system (she was one of us!). This ekiden is 4-person teams, 5k each, along the wide path next to the Arakawa river in northern Tokyo. There were 1,700 teams in two divisions (men's and women's/mixed). I suppose 1,000 teams in the men's division. The weather was about 17C/63F and raining, although not hard rain. Unfortunately one of our members got sick the day before and could not run. I found a substitute, but due to a communication problem (misunderstanding) he did not make it. However, it was ok, since I was coming off a hamstring problem and the other two guys, Paddy and Harrisson, both have had sore ankles. So none of us was treating this as a "must try to run fast" race, but rather as a "let's see how the injuries are" race. And since it was chip timing, we got our official times, even though we did not officially finish. I ran the first leg. Due to waiting for the fourth member and a long line at the registration, I only had time to jog 300m to the toilet, then another 300m to the start. I started in the middle of the pack, so could not move too well for about 500m, and then better but still not up to speed for the next 500. Actually, this was just as well, as it served as a warmup. Still, I ran it in 4:06. The rain was not a factor, but the puddles were. After that I moved out and got into a good rhythm, having fun picking out groups to pass and flying (well, kind of) by them. I felt good and the hamstring was fine. Didn't even think about it. I didn't see any of the remaining kilo marks, but there was a 3.5k mark at the second turnaround. The course went out, turned 180°, came back past the start, went out the other direction, another 180, then back to the start area and around a track, where the handoff zones were. It was perfectly flat...a good course and good for spectators/teammates. Anyway, at the 3.5 mark I was 12:56, so 8:50 for 2.5k, or 3:32 per k. (17:40 pace if the marks were correct). Finished in 18:32, so the last 1.5k was 5:36, or 3:44 per k. Paddy's garmin measured the course at exactly 5k. Anyway, 95% if not 100% of large Japanese races are measured correctly. So considering I have not done any hard training for the past 5 weeks (except for a few sessions of 400s, which were not that hard), and considering that my 5,000m time trials over the past year have been about 18:50 (not races, but as hard as I could go in training), I am very happy with 18:32. Of course, immediately after saying that, I think, gee, if I get into really good shape I could give sub-18 a shot. By October, I intend to be in really good shape (marathon shape, but my 5 and 10ks are based on stamina and not speed anyway) so maybe I should try to run a 5k race then. I am planning a 10k and a half...maybe I can fit a 5k in also. Before a marathon in November (probably Tsukuba). Looking directly ahead, there is a big 5,000m time trial on the track this thursday - our club and several others. If the hamstring is ok I will try to run a good time then. Then ease into marathon training the following week. As for the dnf ekiden, next year we will come back and run it well! We now know exactly what to expect, where to be, when to be there, etc., and it's a fun race, so...next year! Hope you dear readers are running well and enjoying the warmer weather (don't know about you Aussies in Oz). 18:32 is a geat result Bob, particularly as you are not in 5k training mode. Sub-18 is certainly a realistic target for later in the year. Well done on such a fast time. 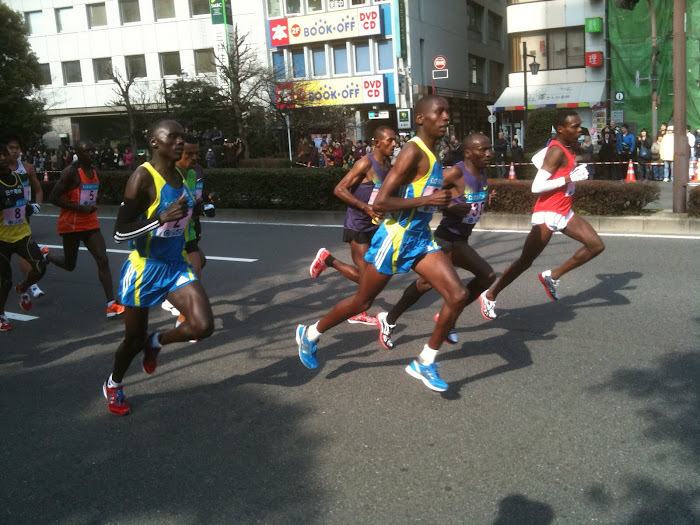 Pity I'm not in Tokyo I would have loved to run that Ekiden with you guys. Yes, great 5K out of training. That's a great result Bob, esp considering the congested start and dodgy warm-up. You can definitely look at sub-18 off the back of marathon training later in the year. 1,700 teams is amazing! I remember Mari Tanigawa from the Gold Coast - she won the marathon in '92. And yes, not that warm in the afternoons down here. 5C is about it with wind-chill. I love following your workouts.